Great excitement in Midleton on the Bank Holiday weekend. The Midleton Farmers Market was joyfully celebrating its 15 year anniversary. Nationwide, broadcast directly from the Park Hotel where they linked directly on the SDN line to Bloom least anyone should imagine it was ‘all’ happening in Dublin. Brenda Donohue, interviewed Sandra and Joe Burns about the vegetable crisp business they have started on their farm in Killeagh to add value to their produce. Jo, is son of the legendary Mrs Burns who was a well-known trader long before the Farmers Market started. Local celebrities, The Crystal Swing band drove all the way from Letterkenny through the night to meet Brenda who had heard news of Dervla marrying a local farmer in August. Brenda was hugely impressed by the vibrant Midleton Farmers Market in full celebratory mood with bunting, balloons, face painting and lively music provided by Trí na Ceile from Killeagh. Several of the original 12 stallholders that started the market on the June Bank Holiday weekend in 2000 are still trading. Ted Murphy, a stalwart of the market from the very first day was there as was Frank Hederman artisan fish smoker from Belvelly near Cobh. Willie Scannell whose flowery Ballycotton potatoes are much loved by his ever growing band of loyal customers. Fiona Burke’s stall with a beautiful selection of Irish farmhouse cheese and Jane Murphy’s Ardsallagh goat’s cheese are still part of the market. So too are David and Siobhan Barry’s seasonal vegetables with a much larger selection than on the first day. Toby Simmonds of The Olive Stall was also there at the outset and his stall also trades beside the market. The Midleton Farmers Market soon became the yard stick by which other markets were measured. Stall numbers grew and it quickly became oversubscribed with many farmers and food producers clamouring to be part of a business model that was clearly an excellent prototype. Other Farmers Markets were established around the county and country (160 at last count) enabling local people to buy fresh local food in season from those who produce it, going some way towards realising my dream of a Farmers Market in every town in Ireland. It is now well proven that a successful Farmers Market in a town not only brings extra business overall but also food tourists (of which there are an ever growing number) but also positive publicity which benefits everyone in the community. John Potter Cogan who initially approached me after the vegetable processing plant Frigoscandia had closed was a vitally important part of the initial impetus. He was a member of the Chamber of Commerce who with the Midleton Town Council had the vision to see that a Farmers Market (which by the way was quite a revolutionary initiative at that time and even considered by many to be a retrogressive step) would be a positive initiative for the town. There are now 27 stalls soon to be 33, the variety of produce is absolutely tantalizing from artisan bread, vegetables, herbs and fruit in season, organic produce, local honey and oysters, fresh fish, wild mushrooms, home baking, cordials and pickles, gluten free treats, foraged food, smoked fish and homemade pate, shellfish, heritage pork products, local ducks, chickens and eggs, farmhouse cheese, pies, freshly made salads, chocolate and long queues for freshly made coffee. Market goers can enjoy a pizza straight from Simon Mould’s wood burning oven, a BLT or pulled pork sandwich from Woodside Farm and much much more. The Farmers Market provide a livelihood for many, an opportunity to buy local food from small production systems and an alternative shopping experience for families who wish to engage directly with those who produce the food they buy to nourish their family at a time when a growing number of people realise that our food should and can be our medicine. Congratulations to everyone at Midleton Farmers Market. The heading of an article by Joe Duggan in The Irish Examiner on Tuesday June 6th 2000 was ‘Market Heralds A New Era In Direct Selling of Natural Produce’, I’m proud to have been a little part of that initiative. Do not miss dinner at Good Things Café in Durrus on Friday June 19th – a feast of seasonal produce cooked beautifully by Carmel Somers. Another exciting date for your diary …..Listowel Food Festival from June 18-21 2015. An eclectic programme again this year with foraging, markets, cookery demos, dinners…..the website www.listowelfoodfair.ie is choc a bloc with info. Congratulations to Aoife Rice from Cloyne National School, the overall winner of the 15 Year Midleton Farmers Market Anniversary Art Competition to paint a picture of your local Farmers Market or market stall. Castlemartyr National School also got honourable mention for their beautiful collage of paintings. There are dozens of variations to this recipe, every Chinese chef would have his very own favourite recipe for barbecue ribs. Some of the recipes call for the ribs to be par-boiled prior to being cooked. Some recipes call for the ribs to be roasted in an open roasting tin and some recipes call for the ribs to be roasted in a tinfoil parcel. This recipe is one that I have found to be very successful and simply delicious. This is of course a very popular starter in many restaurants in the West. When serving barbecue ribs as a starter, always provide a “finger bowl” to wash fingers as the only way to enjoy these ribs is to eat with your fingers. out a little on roasting. Shred the ginger very finely, and crush the garlic. Place all the pork ribs, ginger and garlic together into a very large bowl and add the sherry , nutmeg and the 5 spice powder and mix together. Then add the’ hoi -sin’ sauce and mix thoroughly. Serve hot garnished with lettuce, peppers and lemon slices or wedges. We’ve just had the first of the new potatoes – try cooking them in seawater amazing. 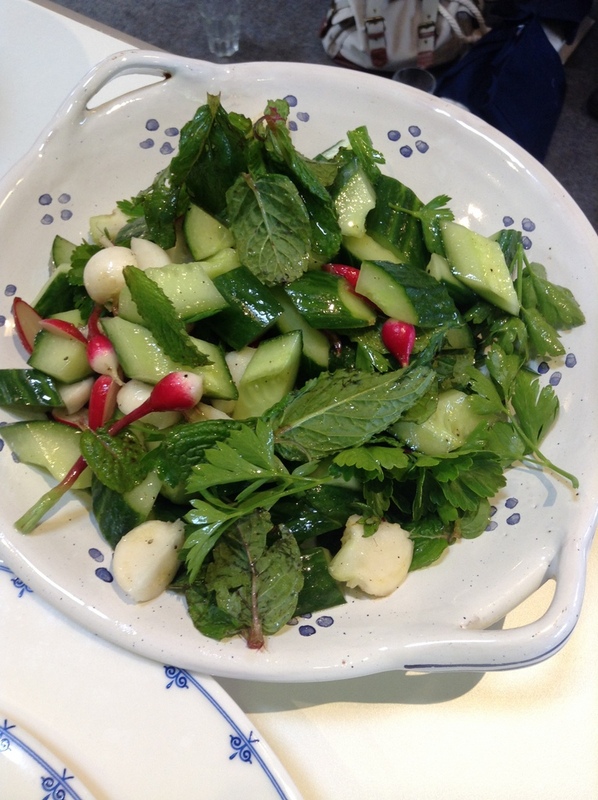 Love this simple little salad with the first of the new seasons cucumber, radish and mint. Cut the cucumbers in half lengthwise and then in half again. Cut into 2cm (3/4 inch) slice at an angle. Trim the radishes and cut into similar size pieces, mix with the cucumber. Season with salt and freshly ground pepper. Drizzle with extra virgin olive oil and freshly squeezed lemon juice. Toss gently, add lots of flat parsley and fresh mint leaves. Taste and correct seasoning, add a little honey if necessary. I’ve chosen to use green gooseberries and elderflower in this recipe, but the filling changes with the season. We always have a fruit tart of some kind on the sweet trolley at Ballymaloe, and it reflects what is in season at that time. Sometimes we add some spices, fresh herbs or wild flavours like the elderflowers in this recipe – whatever complements the fruit. Preheat the oven to 220ºC/425ºF/ gas mark 7. Roll out half of the shortcrust pastry and line the plate. Trim the edges. Top and tail the gooseberries and pile them up on the plate, leaving a border of 2.5cm (1in). Pick the elderflower heads off the heavy stem and lay them over the gooseberries. Sprinkle the sugar evenly on top. Roll out the remainder of the pastry a little thicker than the base, wet the border around the gooseberries with a little egg wash or water, and press the pastry lid down onto it. Trim the pastry to within 1cm (1⁄2in) of the rim of the pie. Crimp up the edges with a sharp knife and then scallop them. Make a hole in the centre to allow steam to escape. Egg wash the surface. Roll out the trimmings and cut into leaves and decorate the top of the tart, egg wash again. Bake for 35 minutes, then turn down the heat to 180°C/ 350°F/gas mark 4 for a further 30 minutes. Test the gooseberries are soft by inserting a skewer. Sprinkle with fine caster sugar, serve with soft brown sugar and elderflower cream. Add the elderflower cordial to the whipped cream, stir gently, taste and add a little more if necessary.